When I decided I would do a recipe round up, I asked everyone at work what their favorite Thanksgiving side item was, because I didn’t want to forget any ‘biggies’. Stuffing or dressing won by a huge majority, which was funny, because it wasn’t even something I thought of to begin with. I’m not sure why – I like stuffing, it just didn’t cross my mind. But – I knew I had to figure out how to make it. 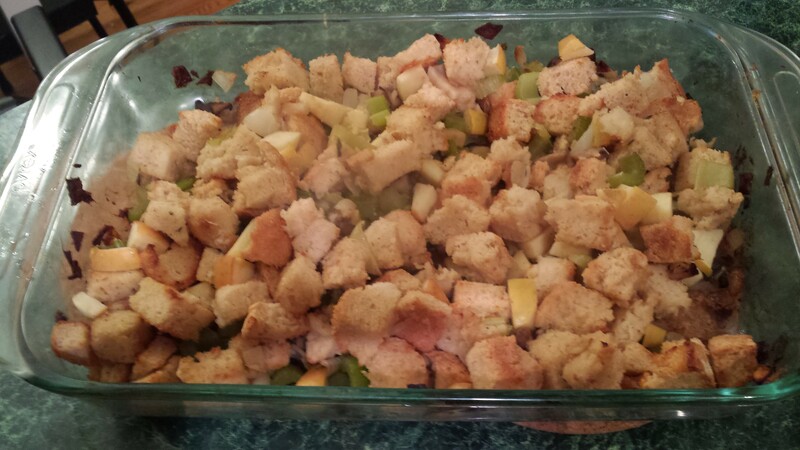 The hard thing with this stuffing was the potential for it to be dry. Gluten free breads vary so much in their texture, that the consistency of the stuffing can vary as well. One thing that does help is if you ensure the bread is toasted well beforehand (steps 1 – 3). Please use the liquid amounts below as a general guideline, and adjust as needed. When you add the apples, if it’s looking dry, certainly add more liquid. What is your favorite Thanksgiving side item?